M&M Performing Arts Company brings another fast paced show to Lyndhurst, a comedy with a ghost, I Hate Hamlet. Performances are in the Grand Picture Gallery of Lyndhurst Mansion. Opening February 10 and running through March 4, 2018, tickets are $40 for Adults, $35 for Seniors/Students (16 and under – appropriate for age 13 and up) and are available at Lyndhurst.org (direct ticketing site is http://lyndhurst.org/events/i-hate-hamlet/). Visitor Information at Lyndhurst is 914-631-4481. Free parking. Andy seems to have it all: a hit television series; a beautiful girlfriend; the perfect New York apartment; and the chance to play Hamlet in Central Park. However, Andy’s TV series has been canceled; his girlfriend is eccentric; his apartment is haunted and he HATES Hamlet! The cast of I Hate Hamlet includes Tal Aviezer, Keith Erik Brown, Amy Frey, Elizabeth Mialaret, Mikel Von Brodbeck and Leslie Smithey. Directed by Melinda O’Brien and stage managed by Nan Weiss and Emmy Schwartz. 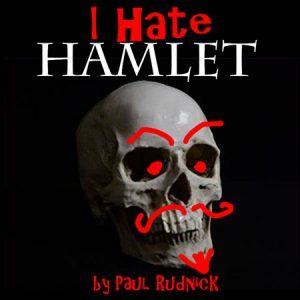 In repertory with I Hate Hamlet will be a coproduction with Red Monkey Theater Group of Shakespeare’s Hamlet. Go to http://lyndhurst.org/events/hamlet/ for information on Hamlet tickets. Guests must be able to climb the main staircase to reach the second floor level as there is no elevator. Lyndhurst, a site of the National Trust for Historic Preservation, is a Gothic Revival masterpiece on the banks of the Hudson River in Tarrytown, NY at 635 South Broadway (Route 9).